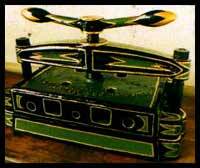 The Columbian press was invented in America by George Clymer in about 1813. He moved to England and began working with R. W. Cope, an engineering firm. The press shown is the largest, and therefore has the largest bed size for use in surface printing. It measures 36 by 24 inches or 91 by 58 centimetres. 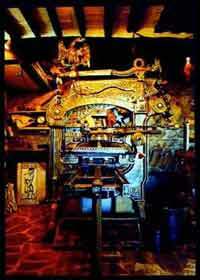 It was first used to print books, posters and newspapers and is now used for the printing of fine art relief work. 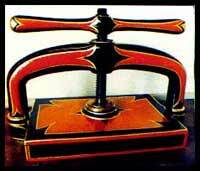 (Woodcuts) The mechanism is one of weights and counter-weights. Known to be one of the oldest methods of printing wood-cutting has been used sucessfully for centuries in both the west and east. The process is one of cutting away the wood along the grain and around the design, leaving the design proud and ready to be inked and printed. Coloured woodcuts can be produced by preparing a separate block for each individual colour and layering the colours one on top of the other. Traditional painting techniques can also be used in conjunction with the wood cut. Circa 1900, the Hunter-Penrose etching press. The etching process is an old method of printing dating back to the 16th century when it was used to engrave armour. It consists in passing the etched plate and dampened paper between two steel rollers. The top roller is forced against the bottom roller under great pressure with the steel bed in between them. The press shown is geared down for ease of operation and the bed size is 36 by 24 inches or 92 by 61 centimetres. A copper or zinc plate is cleaned and polished thoroughly and a special acid resistant ground is applied. The design is then transferred to the prepared plate and the image is drawn into the ground using a needle, exposing the metal beneath. The plate is then placed into a bath of acid and the design is etched into the plate. The untouched ground protects the remainder of the plate so only the image appears. The plate is then cleaned, inked up and printed. The Albion, circa 1822. Invented after the Columbian and with a totally different type of mechanism, it uses a concentric cam and spring compression action. 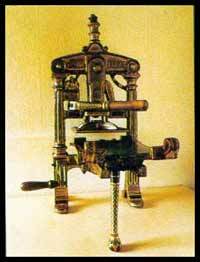 This press is used in printing wood-engravings and small wood-cuts, and is also used for demonstration in exhibitions. Wood engraving is the reverse of a woodcut. It is a white line print where the design is cut away and the background is left black. It also differs from a woodcut in that the wood is cut on the end grain whereas a wood cut is cut along the grain. Thus, the size of the wood engraving is limited, though smaller pieces can be joined. The direct lithographic press, Thomas Grieg circa 1860. Bed-size 36 by 24 inches or 91 by 61 centimetres. 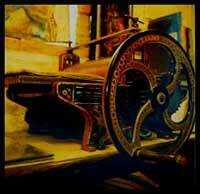 Invented by N. Senefelder, it became an efficient and popular method of printing, the precurser of modern printing. It was also used very successfully by various artists exclusively as a fine art process, or for combinations of art and commerce as in Toulose Lautrecs posters. At the turn of the century all commercial printers then moved into the lithographic way of printing for speed and efficiency. The lithographic process uses the basic principle that oil and water do not mix. The design is drawn/transferred onto a stone slab, traditionally Bavarian limestone, using a very greasy ink or crayon. The stone is then washed over with a very weak acid mix which etches the image lightly into the stone. 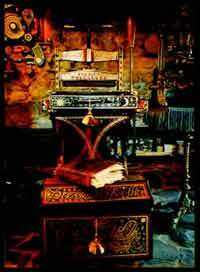 The stone is kept constantly wet, and an oil based ink is rolled onto the stone. The ink only adheres to the greasy drawing. Paper is then laid on top of the stone and both stone and paper are passed through the press which has a scraper action raised to the correct pressure by a cam lever. Silkscreen printing is basically a stencil method which was originally carried out on silk but now various other materials can be used. The area to be printed is blocked out with a gum arabic emulsion which is left to dry. The ink is then squeezed through the material with a rubber blade. As with the stencil method, a different screen is used for each colour required.